To see Queen + Adam Lambert light up Metricon in February will be one of those memories that lives with the audience forever. The atmosphere will be incredible as the lights, sound and stage show come to life before what I predict will be a sell-out crowd. The soaring success of the film Bohemian Rhapsody, the highest grossing music biopic of all time, has proven that the love for Queen remains as strong as ever. Lifelong Australian fans and new converts will be thrilled with the news that Queen original band members Brian May and Roger Taylor are teaming up once more with longtime frontman Adam Lambert on lead vocals and is coming to the Gold Coast’s Metricon Stadium on Saturday February 29, 2020 for a giant stadium shows with a brand-new, spectacular production. Produced in Australia by TEG Dainty, the epic 6 date Rhapsody Tour is set to run from February 13 to February 29, 2020 with the Gold Coast’s Metricon Stadium show set to close the Australian tour. City of Gold Coast Mayor, Tom Tate, said the final show of the Australian tour to be held at Metricon Stadium would be a massive event for the Gold Coast. “Gold Coast. We are the champions! We’ve secured one of the biggest acts, at one of the best outdoor arenas in the world. “To see Queen + Adam Lambert light up Metricon in February will be one of those memories that lives with the audience forever. The atmosphere will be incredible as the lights, sound and stage show come to life before what I predict will be a sell-out crowd. “I see this event as being one that sets a new standard, and direction, for large-scale outdoor music events at this venue. 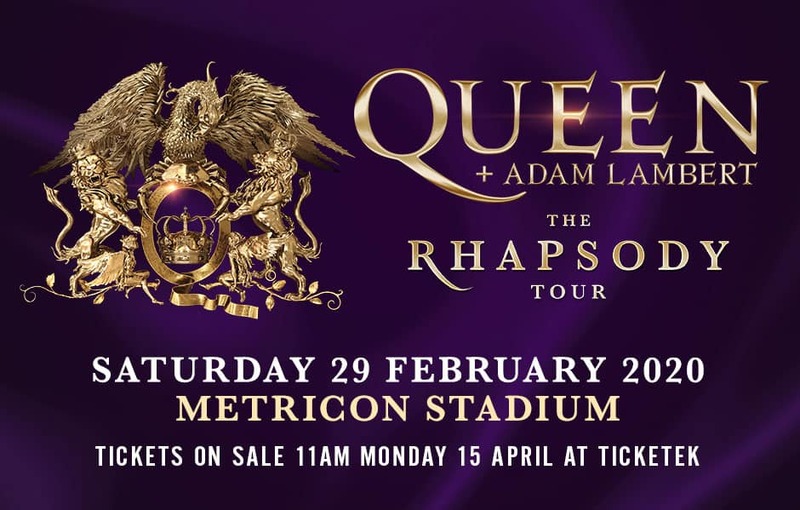 It’s timely we announce Queen + Adam Lambert for Metricon, only weeks after the City launched its Live Music Action Plan. President and CEO of TEG-DAINTY Paul Dainty said the Gold Coast show would be the final show of the Australian tour. Gold Coast SUNS CEO Mark Evans said the giant stadium show would showcase Metricon Stadium’s possibilities once again. “Metricon Stadium is a world class regional multi-purpose sports and entertainment venue that has a proven track record of delivering outstanding events and experiences whether that be an AFL match, major international athletics meet, concerts and cricket. “We are thrilled that in a short window Metricon Stadium will have hosted a global giant stadium show in Queen + Adam Lambert, an International T20 & Big Bash fixtures, the Australian National Athletics Championships, the Opening and Closing Ceremonies of the Commonwealth Games as well as its track and field events in addition to and AFL, and we look forward to continuing to work with our partners to bring more content to Metricon Stadium and importantly Gold Coast in the future. Tickets go on sale from www.ticketek.com.au on Monday 15 April with the Gold Coast show at Metricon Stadium on sale from 11.00am AEST. Check www.queenonline.com and www.tegdainty.com for more tour information.